I'm ever on the lookout for new and inventive books to share with you, and I love it when others recommend books that they, too, love! While presenting a workshop on books for early readers, I asked attendees to share, and one of the books mentioned was Laurie Rosenwald's color book. I had not seen it, but came home to do a search and ordered it. Am I glad that I did! I have shared it often since then, and it always finds a new fan. Now, that is the kind of book we want to have in our homes and classrooms. The mixed media artwork is what sets this book apart from many others. 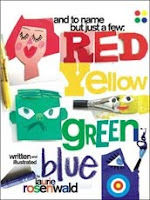 The pages are filled with color, fun, and wordplay. Kids who pore over those same pages will find much to emulate in their own artwork and have so much fun working with color and ideas that share their thoughts on colors, where you find them and how they are so much part of our daily lives. It's not just about colors! It is about graphic design, word choice and fun, fun, fun! Much discussion will follow, fraught with stories that may or may not involve color, but will be about the kids who are listening to the humor and feeling the joy it evokes.